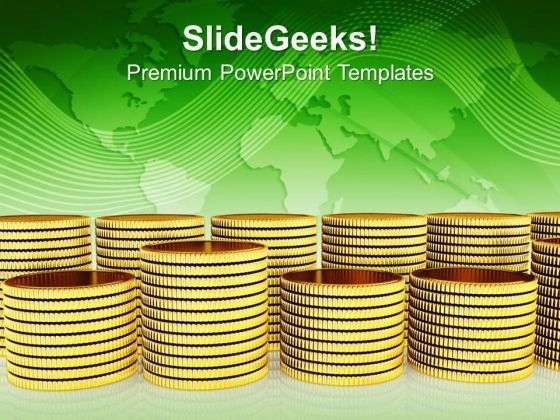 International Coins And Currency PowerPoint Templates And PowerPoint Themes 1012-Our compelling Template consists of a design of coins of International Currency placed n stacked manner. This Template Signifies the Concept of money, coins, legal tender, notes, coinage, exchange, cash, bills, paper money prevalence, frequency, popularity, vogue, circulation, commonness, acceptance, predominance etc. Employ the right colors for your brilliant ideas. Help your viewers automatically empathize with your thoughts.-International Coins And Currency PowerPoint Templates And PowerPoint Themes 1012-This PowerPoint template can be used for presentations relating to-"International Currency And Coins, Business, Success, Finance, Symbol, Money" Show enterprise in your plans. Put them forth on our International Coins And Currency PowerPoint Templates And PowerPoint Themes 1012. Capture emerging international markets with our International Coins And Currency PowerPoint Templates And PowerPoint Themes 1012. They will make you look good.